Traxxas sets the standard for power, performance and innovation. 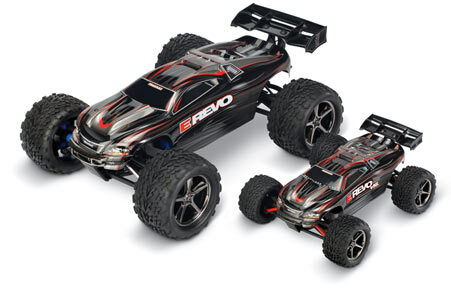 Now, for the first time, all the speed, quality and capability you expect from Traxxas is available in 1/16 scale with the new 1/16 E-Revo VXL. 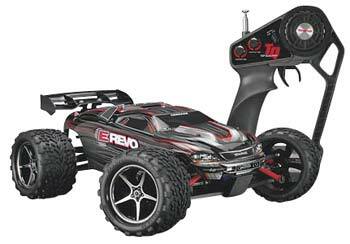 At 14 inches long, E-Revo VXL is about half the size of the 1/10-scale E-Revo. But don't call it a "mini"—this is a whole new category of R/C performance and fun that no mere mini-model can match. Beneath the factory-finished polycarbonate shell, you'll find the winning suspension technology of the seven-time National Champion Traxxas Revo®, screaming Velineon® brushless-motor power, and the convention-busting innovation of the E-Revo. Ever wondered what it would be like to see the view from behind the wheel of your R/C car, plane, or boat? With the GoPro R/C HERO, you can! This miniature, waterproof, shockproof camera is built for all types of radio control action, and mounts easily using the supplied self-adhesive mounting plates and quick-release brackets to capture a driver's-seat view from your favorite R/C machine. for capturing wave-jumping action with the Traxxas Villain boat; GoPro’s waterproof housing protects the camera even if submerged. You can even fly with R/C HERO. Mount the camera in the cockpit or under the fuselage; the camera's 'upside down' mode flips the recorded image for installations that require the camera to be mounted upside down. 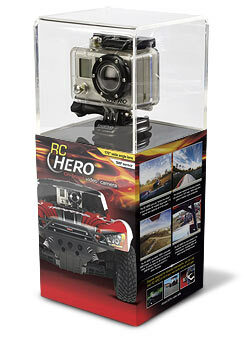 R/C HERO is also perfect for full-size action in your car, on your motorcycle helmet, or wherever your action sports take you.